My home is really dumb. There’s not even a proper thermostat that tells me the actual temperature. If your home is smarter than mine, Elgato’s Eve system isn’t going to amaze you. It’s basically sensors packed into small boxes, which happen to work with Apple’s HomeKit framework. But, Eve still gets the job done. In my test kit, I have a temperature sensor (Eve Room) and a monitor that tells me if my door is open or not (Eve Door). All are basically little white containers full of sensors. Still, each inspires a touch of confidence; they’ve got a better build quality than I expected. Eve’s Door sensor is quite small. The main hub is roughly the size of a small adult thumb, while an even smaller bit sits on the door sill. The Room sensor is much larger — about the size of a MacBook charger. Like many other ‘smart home’ products, they feel lighter than you’d think, almost as if they could shed 60 percent of their mass with ease. 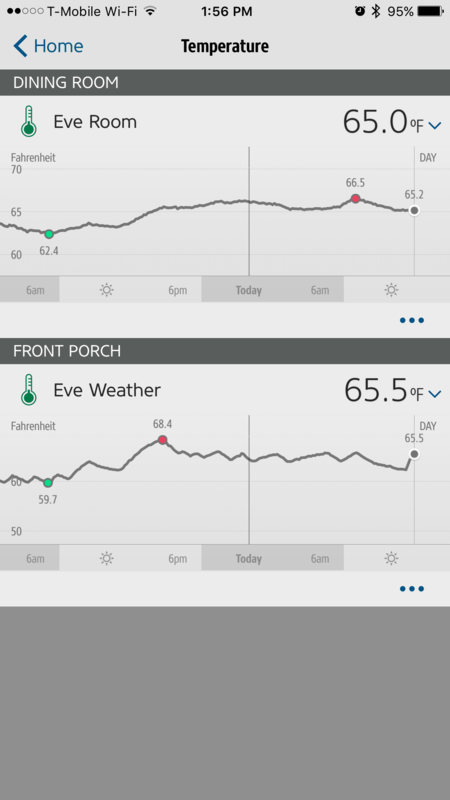 At its basic level, the Eve app tells you what your sensors say. It’s simply laid out, and the info is easily accessible. If you’ve got added components, Eve may work with them as well. I happen to have a few iHome smart plugs, and I can manage them from the app under the “Power” heading (so long as they’ve already been activated). 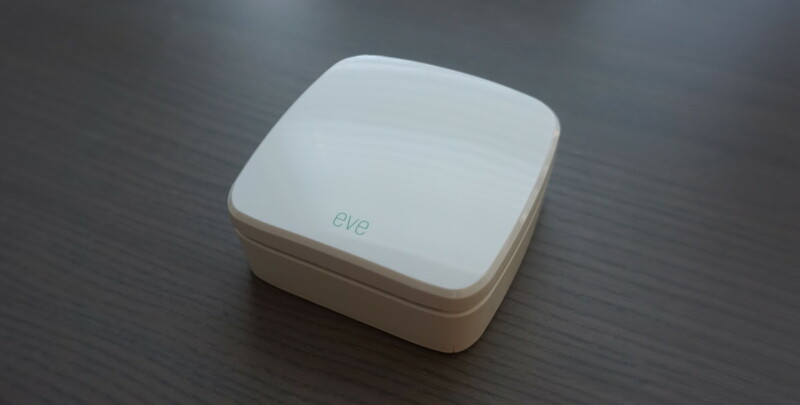 Eve also sells its own smart plug product. 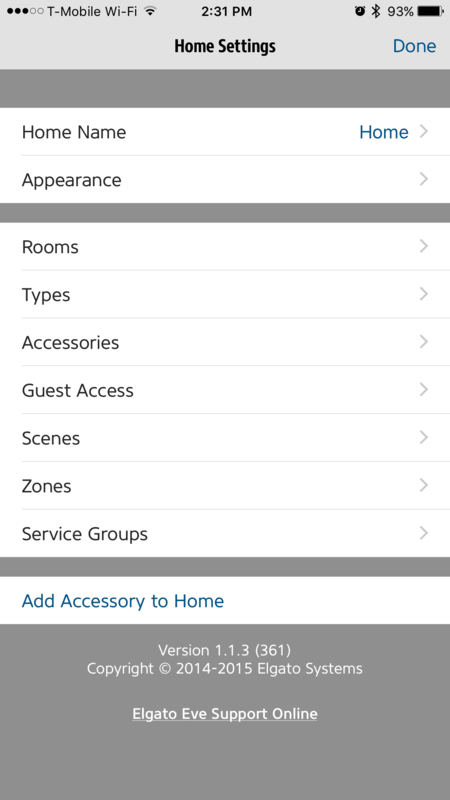 If you like, Eve’s app also lets you set up scenes to manage a series of events (like special lighting for movie night, if you’ve got bulbs that work with HomeKit) with a single touch. Aside from turning my lights on and off, I’ve got no use for this (yet). If I had more smart home components, it’d be quite useful. 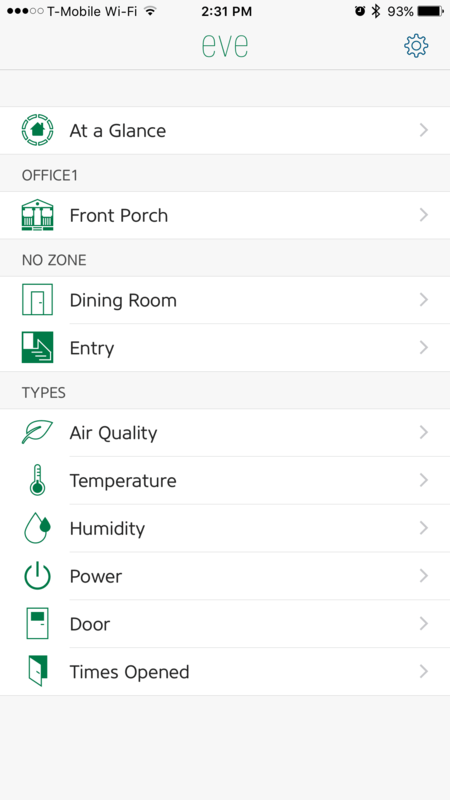 With the app, you can get quite granular about controlling parts of your home, too. If I wanted to turn the lights in my home on at a certain time (so long as they were plugged into a smart plug, of course), I could set that up. Similarly, I could choose to manage individual rooms. Because it’s HomeKit enabled, Eve works with Siri. That’s awesome, but also limited. 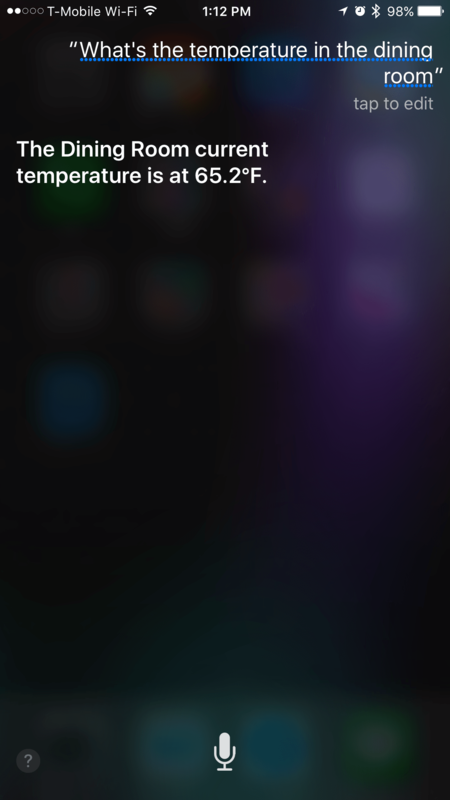 I can ask Siri what the temperature or humidity in my dining room are, for instance, but she thinks I’m joking when I ask how often the door has been opened — or if it’s open. 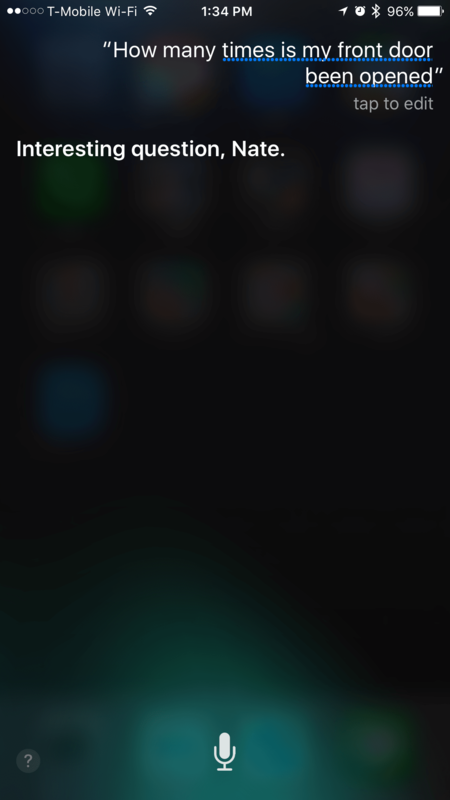 Siri isn’t all-knowing (yet), so I’ll forgive weird shortcomings. I’ll say this: I’m not blown away by Eve. I’m also not impressed with the lame thermostat in my apartment either, which makes Eve oddly perfect for me. Setup is easy. Like other HomeKit products, each device has an eight digit authentication code you have to enter. After that, Eve just kind of — well, it just works. Because my thermostat doesn’t give me granular details on what temperature rooms are — or even my whole home — I’m left to base things on how hot or cold I feel. Each room has one of those dumb thermostats/temperature dials, so getting a Nest or something similar isn’t really an option. Though my test with Eve was limited to a few sensors, I could put one in each room, if I wanted to. There doesn’t seem to be a limit to how far you can scale Eve. 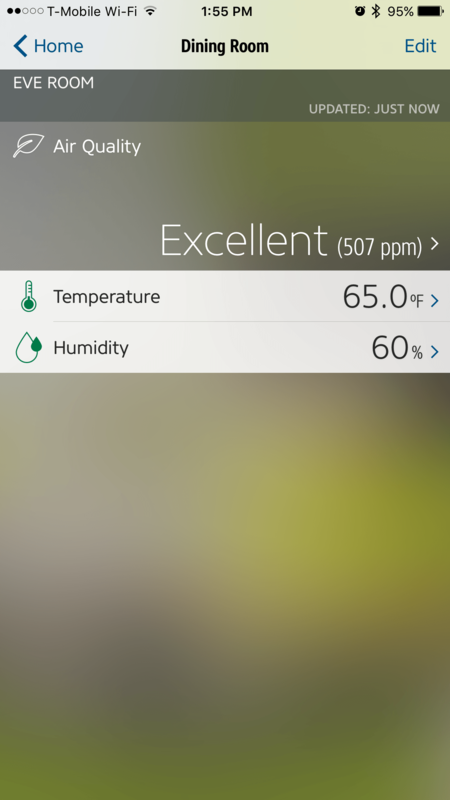 In addition to the temperature, Eve tells me about the humidity in a room as well as the air quality. I just wanted something that could tell me what temperature my room was, and I got it with Eve Room. The Door monitor is cool, but I’m pretty careful about not leaving my door open, so it’s mostly useless. For $79.95, Eve Room is a nice accompaniment. I’m not in a position to swap out my dumb thermostat just yet, so Eve gets the job done just fine. But it’s hard to argue the case for Eve outside of my use case. 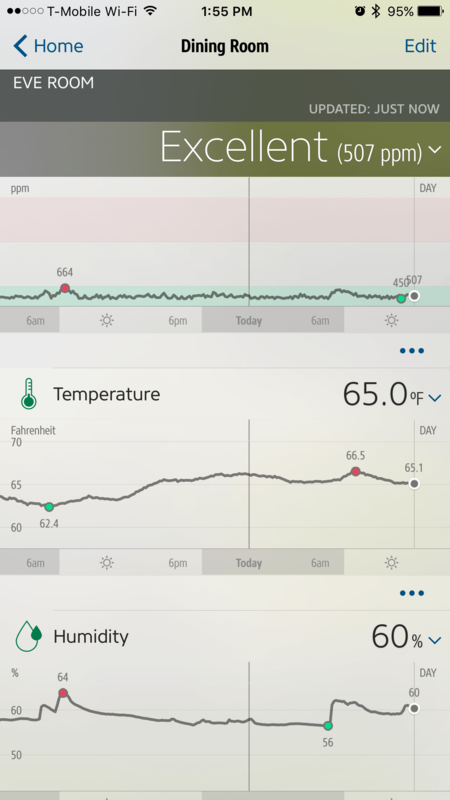 If I were in a position to rid myself of a dumb thermostat, I’d likely get an Ecobee — which has sensors similar to Eve, but is also a smart thermostat. I am surprised at how much I like what Eve has to offer, but it’s also a bit passive. I can’t set up notifications to let me know if a room gets too hot or cold, or that I’ve left a lamp on in another room at bedtime. But, for my dumb house, Eve levels me up just enough.